Pool your abilities to find the Street Seats exhibit. Spending quality time with your mentee is one of the biggest keys to success for a well established mentor/mentee relationship. While touching base over a cup of coffee is one way to strengthen the relationship, you may want to consider attending an event together that your mentee is passionate about. For those in the design world, one of the potential activities for mentors and mentees could be to visit the Design Museum Boston. 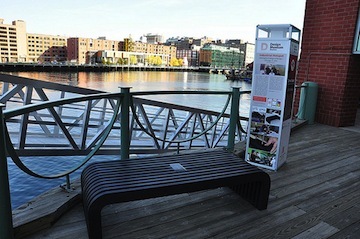 The Design Museum Boston is the region’s first of its kind as the museum is solely dedicated to design. The mission of the museum is to not only educate its visitors about how design fits into their world, but to also unite the Massachusetts design community. The museum puts on a number of events throughout the year, which could provide you and your mentee the perfect introduction to the museum. Once a month, the museum hosts CreativeMornings, which includes a twenty minute lecture typically given by a local designer and is followed by a 20 minute group discussion. This event is free of charge and provides the ideal opportunity to network with other members of the design community. Another exciting upcoming event is the dParty, which takes place on June 1 from 6 – 11 pm and will include music, food, drinking, and dancing. This event provides patrons with a fun and unique way to celebrate the Boston design community and make new contacts. To find out about more activities for mentors and mentees, please contact us at the Over My Shoulder Foundation!